필리핀은 6·25 전쟁기간 연인원 7천420명을 파병했고 이 가운데 112명이 전사했고 299명이 부상했다. 경기도 고양시 덕양구 관산동에 필리핀 참전기념비가 있다. “한국 전쟁은 결코 잊혀진 전쟁이 아닙니다. 한국전쟁은 영원히 우리들의 기억 속에 남아 있을 것입니다.”제64주년 율동전투기념식이 지난 23일 오전 7시 30분에 필리핀 국립묘지 한국전 참전기념탑에서 필리핀 마틴 N 핀토 준장, PEFTOK 빌로리아 회장, 주필리핀대한민국대사관 이재환 공사, 한인총연합회 김근한 회장, 부인회 이화란 회장, 엄익호 재향군인회장, 이영백 민주평통동남아북부협의회장을 비롯한 관계자 및 PEFTOK 회원 및 가족, 필리핀 재향군인회 회원들이 참석한 가운데 참전기념탑에서 헌화행사를 가졌다.필리핀정부를 대표해서 참석한 필리핀군 정보참모 마틴 N 핀토 준장은 주필리핀한국대사관 국방무관 김인수 중령과의 한국 인연에 대해 한국말로 소개하면서 필리핀과 한국은 혈맹으로 맺어진 우방이라고 강조했다.율동전투는 1951년 4월 23일에서 24일 양일간 필리핀군과 중공군 사이에 벌어져 중공군을 몰아냈던 율동전투를 기념하기 위한 것이다. 필리핀은 한국전 당시 연인원 7,148명이 참전해 전사 112명과 부상 및 실종 약 350명의 희생이 있었다. 가장 치열했던 전투는 철의 삼각지에 있었던 율동전투로 중공군 1개 대대를 격퇴했다. "자유수호 전쟁 참여 보람..양국민 우방임을 잊지 말아야"
(마닐라=연합뉴스) 정재용 특파원 = "고지 하나를 서로 차지하기 위해 닷새 동안 유엔군과 중공군이 일진일퇴의 공방전을 벌였읍니다. 아직도 치열했던 `이리 고지전투'(Battle of Hill Eerie) 당시를 생생하게 기억합니다." 필리핀 한국전참전용사협회(PEFTOK) 사무총장을 맡고 있는 콜로벤시오 도밍게스(79.예비역 대령) 씨는 지난 11일 마닐라에 위치한 참전용사협회 사무실에서 연합뉴스 기자와 만나 이같이 말했다. 이리고지 전투는 6.25 전쟁 때인 1952년 5월 18일부터 6월 21일 사이 강원도 철원군에 위치한 작은 산인 `이리고지'를 놓고 한국군 및 유엔군이 중공군과 벌인 전투를 말한다. 당시 이 고지에는 중공군이 강력한 진지를 구축해 버티고 있었으며, 유엔군들은 이 고지를 `섬뜩하다' `무시무시하다'는 뜻을 가진 `이리고지'로 불렀다. 아군은 한달여에 걸친 적극적인 공세 끝에 결국 이 고지를 차지했다. 이리고지의 전투에서는 미군 제 3사단에 배속돼 있던 필리핀 전투단이 큰 공을 세웠으며, 도밍게스씨도 이 전투에 참가했다. 도밍게스씨는 한국전이 한창이던 1952년 4월 필리핀 제 19전투단 소속 포병으로 6.25전쟁에 참전해 1년 가량 북한 및 중공군과 전투를 벌였다. 사병이었던 그는 6.25 전쟁 후에는 필리핀에 돌아가 장교 시험에 합격해 1982년 대령으로 제대할 때까지 30여년의 군생활을 했으며, 현재는 필리핀 한국전참전용사협회 사무총장으로 일하고 있다. 도밍게스 씨는 "6.25 전쟁 당시 필리핀군은 다른 어느나라 군대보다 용감하게 싸웠다"면서 "공산주의에 맞서 자유를 수호하는 전쟁에 참여한데 대해 보람을 느낀다"고 말했다. 6.25전쟁 당시 우리나라에 전투병을 파병한 국가는 미국, 영국, 캐나다, 호주 등 16개국에 이르지만, 필리핀이 참전국이었다는 사실을 아는 우리나라 국민은 그리 많지 않다. 필리핀은 북한군이 남침하자 미국, 영국에 이어 세번째로 군대를 파견한 나라였다. 총 7천420여명의 전투단을 파병, 전사 116명, 실종 16명, 부상 299명의 희생자를 냈다. 특히 1951년 4월 22일과 23일 이틀 동안 경기도 연천군 율동에서 필리핀 전투단이 1개 대대의 병력으로 중공군 3개대대와 치열하게 싸워 승리를 거둔 율동지구 전투는 한국 전쟁사에도 기록돼 있을 정도로 유명한 전투다. 연천군 연천읍 상리에는 율동지구 승전을 기념하기 위한 필리핀 참전비가 세워져 있다. 도밍게스 씨는 "피델 라모스 전 필리핀 대통령도 6.25 전쟁 참전용사였으며, 이번 필리핀 대선에서 사실상 당선된 베니그노 노이노이 아키노(50.자유당) 상원의원의 부친인 고(故) 베니그노 니노이 아키노 전 상원의원도 6.25 전쟁을 종군기자로 취재했다"고 소개했다. 필리핀 500페소 지폐의 뒷면에는 종군기자 시절의 아키노 전 상원의원의 모습이 새겨져 있다. 한국전에 참전했던 필리핀의 노병 가운데 3분의 1 가량이 현재 생존해 있다고 도밍게스 씨는 전했다. 참전용사들은 해마다 율동전투 승전기념일인 4월 23일 기념식을 거행한다. 또 필리핀 정부도 과거 조지프 에스트라다 대통령 집권 시절부터 9월 7일을 `한국전 참전용사의 날'로 지정해 기념하고 있다고 한다. 도밍게스 씨는 한국과 필리핀 수교 60주년을 맞은 지난해에는 필리핀 참전용사들을 이끌고 한국을 방문, 부산 유엔기념공원에서 열린 필리핀 참전용사들의 넋을 기리는 기념비 제막식에 참석하기도 했다. 도밍게스 씨는 "6.25 전쟁 당시에는 한국은 그야말로 폐허와 다름없었다. 도시에도 변변한 건물조차 없었다"면서 "아시아에서 가장 가난한 나라에 속했던 한국이 이처럼 빠른 기간내에 엄청난 경제성장을 이룩한 것은 기적과도 같다"고 말했다. 그는 또 "참전용사로서 한국이 날이 갈수록 잘 살고 국제사회에서 영향력도 커지고 있는데 대해 보람을 느낀다"면서 "필리핀과 한국이 목숨을 걸고 자유를 지켜낸 우방이라는 사실을 두 나라 국민이 잊지 말았으면 좋겠다"고 강조했다. 도밍게스 씨는 우리나라 정부가 해마다 필리핀 참전용사 후손 150여명에게 장학금을 지원하는 등 각종 지원사업을 펼치고 있다고 소개한 뒤 "한국 정부가 필리핀 참전용사들과 가족들에 대해서 지속적으로 관심을 기울이고 있는데 대해 감사하다"고 말했다. 우리나라 정부는 지난해에는 필리핀 마닐라시의 국립묘지에 위치한 한국전 참전 기념비를 보수한데 이어 올해는 마닐라의 명소인 리잘 공원에 6.25참전기념 동상도 세워 다음달 제막식을 가질 예정이다. 국가보훈처는 또 필리핀군 총사령부 부근에 6.25전쟁 기념관도 건립할 계획을 세워놓고 있다. In March 1952, Hill Eerie was the responsibility of the United States Army's 45th Infantry Division – Company K, 179th Infantry, commanded by Captain Max Clark. On March 21, 1952, the twenty-six personnel of the third platoon, under the command of Lieutenant Omer Manley, set out to take over the outpost. Manley's men made up two rifle squads, a light-machine-gun squad and a 60-mm mortar squad. Manley sent out two patrols to establish an ambush site around the hill. That night, both patrol squads sighted enemy activity. At 23:30, the Chinese attacked and a machine gun duel between the two sides ended after Captain Clark's troops on Hill 418 supported his men in the Eerie outpost with supporting machine-gun and mortar fire. The battle continued on the morning of March 22 with the Chinese forces penetrating the outpost's perimeter and eventually overran Manley's men. Clark was then ordered to concentrate his artillery fire on Outpost Eerie after losing communications. At 01:30, Regimental Commander, Colonel Frederick A. Daugherty, ordered Clark to advance toward the hill and retake the hill. Clark's men searched the area and found out that, of the 26 men who had defended the outpost, 8 were dead, 4 wounded, and 2 were missing (Lieutenant Manley and Corporal Joel Ybarra). They also recovered 31 enemy dead from around the hill and captured a wounded Chinese soldier. Later, Clark withdrew his troops to the main line of resistance. In May 1952, the 20th Philippine Battalion Combat Team, under the command of Colonel Querobin, engaged the Chinese forces at the town of Karhwagol, west of Chorwon; they were also involved in other major battles and assaults against the Chinese forces. There were numerous closely fought battles on Hill Eerie, as well as on Hills 18, 200, and 19, ('Yoke', 'Uncle' and 'Old Baldy'), all in the T-Bone Hill area, but later the 20th were committed to the Beef Steak Hill area and in Alligator Sky. Hill Eerie was a military outpost that changed hands many times and was a heavily fortified position with a commanding view of the plains below. A series of raids were launched by the Filipinos, from May 18, led by Lieutenant Rodolfo Maestro, killing 28 CCF and a further 23 the next day, before disengaging with the enemy while tanks and artillery continued to bombard the outpost. On May 21, 1952, Colonel Abcede ordered Major Felizardo Tanabe, the battalion's operations officer, to prepare the final assault on the Chinese position after several attempts to capture the outpost. Tanabe sent the 44-man 2nd reconnaissance platoon to sabotage the position. The platoon was led by a young Filipino officer, a 1950 graduate of West Point's United States Military Academy, 2nd Lieutenant Fidel V. Ramos (future President of the Philippines). Ramos divided the assault team into four groups of snipers, riflemen, scouts and forward observers, each with a radio operator, a messenger and a medic. The platoon was reinforced by some engineer demolition specialists and an artillery observer team. They left at 04:07. The Filipino platoon crawled through rice paddies and scattered trees for two hours before it reach an irrigation ditch, about 400 meters from the top of the hill. Intelligence estimated the enemy strength to be one reinforced platoon of the Chinese Red Army. The United States Air Force sent seven F-86 Sabre jet fighters to pound the enemy positions with napalm. There was also artillery support. After the bombardment, Ramos' men seized the front part of the trench network after discovering a hole in the blasted stack of barbed wire. Close-quarter fighting raged as the retreating enemy fought back but the advancing Filipinos were gaining the upper hand. The scout team, led by Corporal Jose Palis, went into action on the right of the hill and was later joined by Lieutenant Ramos. Meanwhile, the rifle team, led by Sergeant Cipriano Drapeza, worked its way round to the left side of the hill while the sniper team, led by Second Lieutenant Yel Claveria, held the enemy's support from nearby Hill 191. By 07:28, the Filipinos had demolished the Chinese bunkers and withdrawn from the top of the hill. Friendly tanks resumed their bombardment of Hill Eerie. The assault lasted for two hours, Ramos' men suffered one injury while the Chinese had 1100 dead, 2540 wounded, whether from the supporting artillery, tanks and air strikes could not be determined. The battle was the final assault on Hill Eerie by the United Nations forces. The Filipino battalion was replaced by the 2nd Battalion of the 179th United States Infantry. On June 16, 1952, the 19th Philippine Battalion Combat Team, under the command of Colonel Ramon Z. Aguirre, relieved the American battalion in the T-Bone ridge sector. By June 18, the Chinese forces sought to recapture the area and launched an intense artillery and mortar barrage. The Filipinos held their ground and were able to repulse the Chinese attack. On June 20, the Chinese forces launched another attack towards Hill Eerie and the rest of the T-Bone ridge area. At dawn, the Chinese had advanced sufficiently to engage in hand-to-hand fighting but the Filipino troops were able to hold the position. By morning, the artillery battle continued but the allied forces successfully defended Hills Eerie and 191. 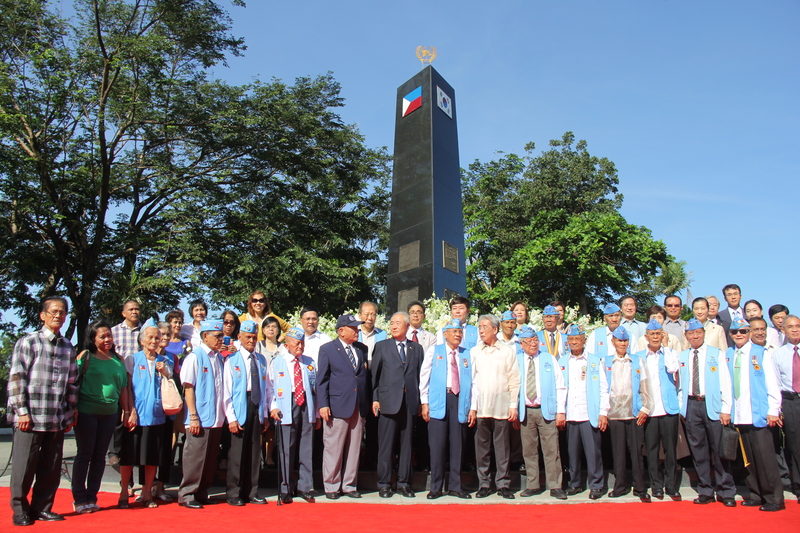 As a result of the battle it was estimated that the CCF suffered 500 casualties while the Filipinos had 24. The Filipino battalion was later relieved by the US 2nd Infantry Division on July 18, 1952. Capt. Conrado D. Yap, a member of the Tenth Battalion Combat Team, Philippine Expeditionary Force to Korea (PEFTOK), was one of the soldiers who were killed in action during the Battle of Yuldong on April 22-23, 1951. Shortly before midnight on 22 April 1951, his company, occupying defensive positions, came under a vicious hostile attack which seriously penetrated the perimeter. Exploiting the breach, the enemy launched successive, determined assaults throughout the night. Constantly exposed to machine-gun, mortar, and artillery fire, Captain Yap crawled from foxhole to foxhole, steadying his men and encouraging them to hold firm. Learning that his First Platoon had been overrun, and despite orders from his battalion commander to withdraw his unit, he fearlessly led a daring charge in a determined effort to reach the beleaguered platoon. Overwhelming enemy strength and heavy fire received from flanks and to the front notwithstanding, they relentlessly pressed the assault, regained the hill, evacuated the casualties, and rescued the isolated unit. Observing a stricken soldier on the slope of the hill, Captain Yap immediately started toward the man but was mortally wounded by a burst of enemy fire. Inspired by his heroic conduct, his men continued the fight with such determination and skill that the enemy attack was contained and numerous casualties were inflicted. Captain Yap's display of courage, devotion to duty, and inspiring leadership reflect the highest credit on himself and the Army of the Republic of the Philippines. He was awarded the CONGRESSIONAL MEDAL OF VALOR, the highest award that the Philippine Government can give; and the DISTINGUISHED SERVICE CROSS, the highest award given by the United States Government to a foreign officer. "My dearest Pa, It is now exactly 65 years ago today when you and your courageous men, who were fighting for democracy in Korea, unfortunately perished in the Battle of Yuldong. That day, with a handful of brave men, you set out to rescue the platoon of Lt. Jose Artiaga, Jr. They were defending a very strategic hill. This hill was essential to the defense of the entire battalion. The communists knew the value of that hill and rushed to overrun it, almost wiping out the platoon. You wanted to make sure that each and every member of the platoon were accounted for. You didn't want to leave any of your men behind. You have to bring them back whole, dead or alive. That is probably why, when I met some of your comrades, just a few years back, they unshamedly wept. When Mom learned of your fate in the Battle of Yuldong , she was devastated -- you were not coming back to us, your family of 3 young girls and wife. The foremost question that came into Mom's mind was how would she manage our lives with you gone forever. Up to now, this is a question people we meet usually ask. "How did you manage?" That's a question that each and every young KIA soldier's family had to deal with. Managing our lives without you is still a continuation of yours and Mom's long life's story. I believe that she was able to raise us to the level of your expectations. Mom passed away just 2 and a half months ago at the age of 94. She could have hand carried this letter when she passed on. But her passing was so sudden. She was just taking an afternoon nap on her favorite easy chair, beside a picture window in Patricia’s house on a hill, overlooking the Bay Bridge in San Francisco, USA. Pa, this is my report to you on how we lived our lives. It is a "mission accomplished" for both you and Mom, though I am fully aware that you were always there, watching over us --- With the realization that you will no longer come back to us physically, the only consolations Mom had were the honors that were bestowed on you. You were awarded the CONGRESSIONAL MEDAL OF VALOR, the highest award that the Philippine Government can give; and the DISTINGUISHED SERVICE CROSS, the highest award given by the United States Government to a foreign officer. You earned both of these honors in the Korean War, fighting for democracy and for sacrificing your life beyond the call of duty. We are so proud of you. And we, your children, try to live up to that precious heritage you left us in our small ways. There were no pensions available at that time to families of young soldiers killed in action. Mom was faced with the day-to-day life of having to raise us, your three young children ages, 2, 4 and 6. Mom had to sell our house in Cubao, Quezon City. We moved back to Grandpa's house in Candelaria Zambales, yours and Mom's hometown and where you first met and courted when you took a vacation from the PMA. With the proceeds from the house sale, she bought some farmland in Zambales and Nueva Ecija. Both sides of your families supplemented the meager income we got from the harvest. When we were all of school age, upon Mom's decision we moved back in Quezon City. With the help of your sister, Angeles and mom's relatives, we were able to finish our education from primary until we earned our college degrees. This family support, characteristic of the Filipino culture, helped us survive life. Galena, your eldest is a UP nutrition graduate and a registered nurse in California. She specializes in the neonatal field and took care of vulnerable and very sick babies. Patricia, your youngest, is an insurance and service counselor and she is so accommodating to everyone who seeks her advise and help. She is like an unofficial life coach to Filipinos in her community. She is based in California, too. I am a UP Fine Arts graduate and an entrepreneur here in the Philippines. My day-to-day life is filled with something Korean. Pa, your spirit must be working overtime here. During the day, I design and manage production of garments. Our materials are sourced from several Korean textile suppliers. In the afternoon and evening, I relax by watching Korean shows and telenovela in KBS, Arirang and iFlix. We also have Korean tenants in our rental property. My mobile phone is Samsung. So, Korea is with me 24 hours a day, 7days a week! Pa, I am just trying to tell you that your death was not in vain because Korea now has a lot to show to the world. They have picked themselves up after the war, where you gallantly fought, and they have progressed phenomenally as a nation. Love you Pa, and extend my love to Ma forever. (서울=연합뉴스) 김귀근 기자 = 국가보훈처는 6·25전쟁 당시 부하를 구출하고자 역습을 감행했던 콘라도 디 얍((1921.1~1951.4) 필리핀 육군 대위를 '4월의 6·25전쟁영웅'으로 선정했다고 29일 밝혔다. 얍 대위는 필리핀 제10대대전투단 특수중대 중대장으로 1951년 4월 경기도 연천 북방의 율동전투에 참전했다. 율동전투는 중공(중국)군의 제5차 공세에 맞서 1951년 4월 22일부터 23일까지 연천 북방의 율동에서 중공군의 공격을 저지한 방어전투를 말한다. 필리핀 제10대대전투단은 수적인 열세에도 강인한 정신력으로 중공군의 공격을 저지해 인접 부대가 철수할 수 있는 시간을 확보했다. 중공군 2명을 생포하고 500여 명을 사살하거나 다치게 했다. 얍 대위는 퇴로 차단의 위기에서 방어전을 전개하던 중 대대장으로부터 즉각 철수 지시를 받았으나 생존자를 구출하고 전우들의 시체를 수습한 후 퇴각하겠다고 보고한 후 역습을 감행했다. 그의 진두지휘 하에 특수중대는 다친 동료 2명을 구출하고 전사한 부대원들의 시체까지 수습하며 고지 탈환에 성공했다. 그러나 이 과정에서 얍 대위는 적의 저격탄에 맞아 전사했다. 필리핀 정부는 얍 대위에게 최고훈장인 '메달 오브 밸러'(Medal of Valor)를 추서했다. 우리 정부는 작년에 태극무공훈장을 추서했다.